It appears that in recent weeks I've been neglecting all of you. Its not that I dont want to hang out. it's not that I'm uninterested blogging, my weeks have just sort of ramped up in terms of work. We're releasing two projects, and still updating the last one, two out of those three projects I'm responsible for. It's an anime series, not an MMORPG like you'd guess from the name. It is however about an MMO. So I'm going to try not to spoiler anything because I want you all to go and watch it, but I need to talk about it a little so there are some minor spoilers. The show is set in an online world called Aincrad, it sounded a lot like .hack// to me at first but there are some major differences, the first and foremost one - the one that changes the story completely - is that on the first day of the game the creator removed the log out button and turned off the safety of their virtual reality helmets and made it so that if the players died in the game world they'd be killed in the real world. The VR Headsets were also different than in .hack// in that they completely controlled your neural pathways, blocking you from moving. In Sword Art Online you moved the exact same way you do in the real world. In .hack// on the other hand you had a VR headset but you were still using a controller. SAO's nervegear took you completely into the world. Now before I continue, can I just point out how awesome that is already. Now you may not like games that much, and that's a valid reaction, games aren't for everyone - though I'm not sure what your doing here considering how much I play and talk about games - but for those of you who do play games as a form of escapism you can't deny that taking the controller out of the game and usign your own movements and mind is a dream that we wish would come true. I know I do, so much so that I think I'd have real problems with this technology. real addiction and problems makign myself log out. That said it would be an ideal dieting method. Anyway, so the creator traps everyone in this ridiculously hard medieval game and tells them that the only way to escape is to beat the game, all 100 levels when the Beta testers only got to level 8 and it took them 4 months. 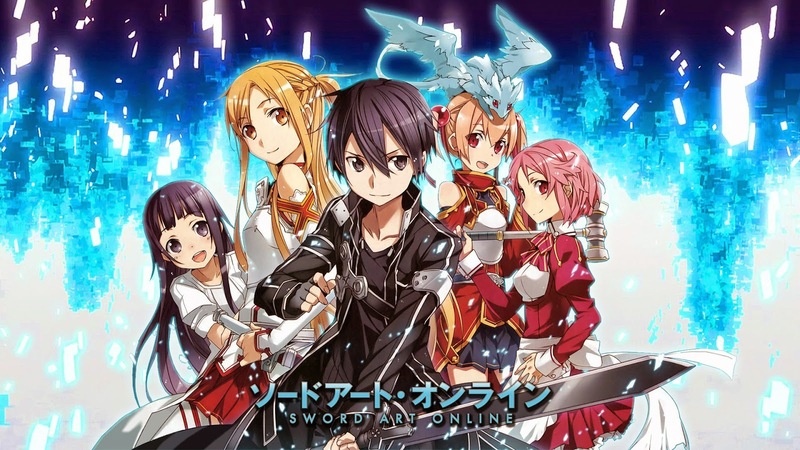 Then most of the rest of the series follows Kirito, a former Beta tester as he deals with the world, tries to save everyone while simultaneously he's being treated like the enemy because he was once a part of the Beta. I absolutely loved it. So much so that at the end I got sad that the technology doesnt exist. So much so that I realised being trapped in that world, my life at risk all the time... it would be brilliant, amazing... dream-like. Regardless of your feeling towards games it's an amazing anime, and that really comes across in the third episode. It really stops feeling like your run of the mill 'everyone the main character runs into is going to be okay' anime. Not to give too much away.